United Launch Alliance’s (ULA) Delta IV has finally launched with the GPS IIF SV-1 satellite following several scrubbed attempts. With Atlantis returning home on Wednesday, the range was cleared for the Delta IV’s latest attempt, which launched from Cape Canaveral at the start of a 19 minute window that had opened at 11pm Eastern. Originally set to launch on May 20, a one day delay was called after it was determined a piece of ground support equipment used to control one of the swing arms on the Fixed Umbilical Tower was not operating correctly and needed replacing. The May 21 launch attempt proceeded nominally until a problem with the telemetry signal between the Global Positioning System satellite and the satellite ground support equipment was lost, an issue that couldn’t be resolved prior to the end of the launch window. Rescheduled for Sunday, May 23 – managers decided not to proceed into the business end of the count, calling for an additional day to work on the telemetry signal issue – while targetting Monday evening for the next attempt. The May 24 countdown appeared to be proceeding smoothly, with polling giving a GO to continue through into the terminal count. However, at T-7 seconds, “Hold, Hold, Hold,” could be heard over the loop, confirming an anomalous data signature with the thrust vector control system on one of the two solid rocket motors mounted to the Delta IV booster. Corrective action would not have been possible within the short launch window, especially due to the late hold, leading to a detanking of the vehicle and a rescheduling of the launch date. With range assets dedicated to the safe return of Atlantis’ landing at the conclusion of STS-132, her return on the first landing opportunity allowed ULA managers to confirm the next attempt could take place on Thursday night. 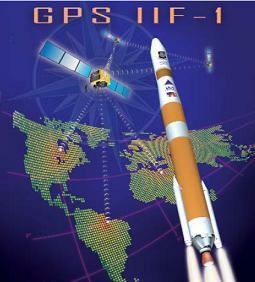 The GPS IIF SV-1 satellite is the first of twelve GPS IIF satellites, built by Boeing under a contract which was signed in 1996. Thirty three were originally planned, but this was scaled back in 2001. GPS IIF will be followed by GPS IIIA, which is expected to see its first launch no earlier than 2014. 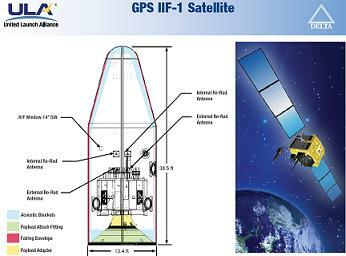 GPS IIF satellites have a mass of around 1,630 kilograms, and are expected to operate for at least twelve years each. GPS IIF satellites are expected to provide navigation signals which are twice as accurate as those broadcast by their predecessors thanks to the digitalisation of the caesium-based atomic clocks used for timing. Currently only ten of the twelve GPS IIF satellites have been allocated launches. The new IIF satellites will also broadcast two new signals. One of these will be used for military navigation, known as “M-code”, which is designed to be more resistant to signal jamming. The other is the L5 signal, which was tested aboard the USA-203 satellite last year. Although USA-203 has been able to successfully demonstrate the L5 signal, and hence reserve the band for use by later spacecraft, interference from transmitting L5 data has affected its other signals, and it has still not been declared operational for navigation. Today’s launch follows on from the final GPS IIR series launch last August, which saw a Delta II rocket orbit USA-206. It is the fiftieth GPS II satellite to be launched, and the sixty-first in total. GPS IIF SV-1 is the first GPS satellite to launch on an EELV, and marks the first time a GPS satellite has launched on anything other than a Delta II since 1985, when the eleventh GPS satellite, USA-10, flew aboard an Atlas E/F. The first GPS satellite, OPS 5111, was launched in February 1978. Eleven Block I satellites were launched, of which ten reached orbit. Block I satellites were primarily used to demonstrate that the system could be implemented. They were followed by nine Block II and nineteen Block IIA satellites, which formed the initial operational constellation. These were followed by a series of twenty one Block IIR replenishment satellites, eight of which were later converted to the modernised Block IIRM configuration. The first Block IIR launch occurred on 16 January 1997, and ended in failure when the rocket exploded just thirteen seconds into its flight. The GPS IIF programme has already experienced a number of delays – the first launch was originally scheduled for 2006. It is also nearly a billion dollars over budget. In May 2009, the US Government Accountability Office issued a report entitled “Global Positioning System: Significant Challenges in Sustaining and Upgrading Widely Used Capabilities”, which was highly critical of the GPS IIF and GPS IIIA programmes. The report also showed scepticism that the US Air Force would be able to keep the system above the minimum operational requirement of twenty four spacecraft past this year, as they expect older satellites to begin failing faster than they can be replaced. The Delta IV is one two Evolved Expendable Launch Vehicles or EELVs which were developed as part of a US government programme to replace older rockets including the Atlas II, Delta II and Titan IV. Its first launch, in 2002, successfully placed Eutelsat W5 into orbit. Today’s launch will be the thirteenth flight of the Delta IV. To date, eleven out of twelve Delta IV launches have been successful; the exception being the first launch of the Heavy configuration, which placed a DemoSat into a lower than planned orbit. United Launch Alliance, who will conduct the launch, is a company which was formed in 2006 to conduct launches of US government payloads on EELVs and Delta IIs. It also conducts commercial launches of the types on behalf of Lockheed Martin and Boeing. 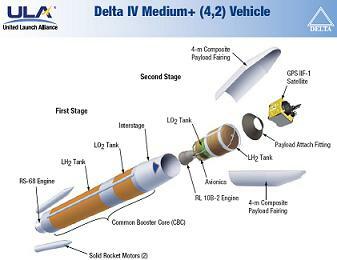 The Delta IV which will launch GPS IIF SV-1, which is numbered Delta 349, will fly in the Medium+(4,2) configuration. This uses a four-metre diameter upper stage and fairing, and two GEM-60 solid rocket motors augmenting the thrust of the first stage at liftoff. The Delta IV is a two stage rocket, and both core stages are fuelled by cryogenic propellants; liquid hydrogen oxidised by liquid oxygen. The first stage, or Common Booster Core (CBC), is propelled by a single RS-68 engine which will ignite about five and a half seconds before launch. The SRMs will ignite a fraction of a second before T-0, at which point the pad swing arms will retract, and Delta 349 will begin its ascent to orbit. It will fly downrange at an azimuth of 105.28 degrees. Just under 47 seconds into the flight, Delta 349 will exceed Mach 1, and begin supersonic flight. Around a minute after launch, it will pass through the area of maximum dynamic pressure, Max-Q. The burn of the GEM-60 solid rocket motors will last until 94.11 seconds into the flight, and 5.89 seconds later they will separate. This will be followed by the first stage main engine cutoff, or MECO, 245.58 seconds into the mission. Six seconds later, sixteen pneumatic actuators will be used to separate the first and second stages. The second stage, or Delta Cryogenic Second Stage (DCSS), is powered by an RL10B-2 engine. It will ignite fourteen and a half seconds after stage separation has occurred to begin the first of three burns. A little over ten seconds later, the payload fairing, which encapsulates and protects the payload during ascent through the atmosphere, will separate from the rocket. The first burn of the second stage will last slightly over seven minutes and forty five seconds, ending with the second stage engine shutting down for the first time, an event known as SECO-1. Following SECO-1, Delta 349 will coast for nine minutes and six seconds. The RL10B-2 will then reignite to begin its second burn, which will last three minutes and seventeen seconds. This will be followed by SECO-2, and then a long coast phase lasting two hours, fifty six minutes and ten seconds. The third burn will begin just under three hours, twenty minutes and forty five seconds into the mission, and will last for 97.87 seconds culminating in SECO-3, the end of powered flight. Just over thirty seconds later, Delta 349 will manoeuvre to the correct attitude for spacecraft separation. This will take a minute and fourteen seconds to achieve. Three minutes and forty six seconds after the manoeuvre is completed, Delta 349 will begin spinning in preparation for spacecraft separation. This will provide spin-stabilisation during the early operations of the satellite. Finally, three hours, thirty three minutes and three seconds after launch, GPS IIF SV-1 will separate from its adaptor atop the DCSS. The target orbit for spacecraft separation has 55.0 degrees of inclination, a semi-major axis of 26,837.5 kilometres and zero eccentricity, giving it an apogee and perigee of 20,460 kilometres. Margin for error is defined as plus or minus 0.2 degrees of inclination, and 74 kilometres of semi-major axis. Two seconds after spacecraft separation, Delta 349 will despin itself, and perform a collision avoidance manoeuvre. Fifteen minutes later it will be oriented thirty degrees out of the GPS orbital plane, and perform propellant blowdown to reach a disposal orbit with a lower perigee, higher apogee and different inclination to that of its former payload. Delta 349 will launch from the Cape Canaveral Air Force Station’s Space Launch Complex 37B (SLC-37B), which is used for all East Coast Delta IV launches. SLC-37B is part of a complex which was originally built between 1959 and 1963 for use by Saturn rockets. The first flight from the pad, then known as Launch Complex 37, was made on 29 January 1964. It marked the first all-up launch of a Saturn I, and the first orbital launch of a Saturn rocket. The last Saturn launch from the complex was of a Saturn IB with Apollo 5, on 22 January 1968. Following this, the complex was mothballed as the Saturn IB would not need to fly again until the Apollo Applications programme got underway. It was demolished in the 1970s after Saturn IB launches were relocated to Launch Complex 39. Construction of the modern SLC-37 began in the late 1990s, with the first launch being the Delta IV’s maiden flight in 2002. Space Launch Complex 6 at Vandenberg Air Force Base is also used for Delta IV launches; however it is currently undergoing modifications to support the Delta IV Heavy configuration. Launches from SLC-6 are expected to resume at the end of 2010, or in early 2011. This is the second Delta IV launch to be conducted so far in 2010, with two more planned. The next Delta IV launch will not occur until October, when a Delta IV Heavy will launch a classified payload, currently identified as Launch 32, for the US National Reconnaissance Office. Another Heavy launch, currently scheduled for December, will also orbit an NRO payload, this time designated Launch 49. NRO Launch 49 will be the first flight of a Delta IV Heavy from Vandenberg, and the first Delta IV launch of any kind from Vandenberg since 2006. Before either of those launches, a Delta II is scheduled to place the COSMO-4 satellite into orbit for the Italian space agency in mid September. The next ULA launch is expected to occur at the end of July, when an Atlas V 531 will orbit the AEHF-1 communications satellite for the US Air Force. The next GPS launch will be conducted using an Atlas V in November.